Since your Xperia Z3 is on the list of Sony devices due an upgrade to Android 5.0 Lollipop, it's probably safe to assume that you're running out of patience. Indeed, whenever the company starts seeding the new firmware, it'll likely be too late for it to not rank last in terms of speediness of software updates. 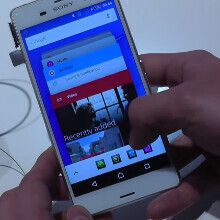 The Sony Xperia M4 Aqua displayed at Sony's booth at MWC 2015 in Barcelona had Lollipop loaded on it, and it of course featured Sony's proprietary Xperia theme on top of it, so, in order to give you a taste of what's coming, we already showed you the new interface, next to the older KitKat layout. Now, however, we've unearthed a video of the Xperia Z3 almighty itself running Lollipop, so we are embedding it below for your viewing pleasure while you wait. As with the M4 Aqua, the changes are mostly under the hood, but Sony obviously had to adhere to the new Material design language, too. The Best Mixed Interface With Stock and Sony's Interface.. The best part of this video is it just showed how crazy fast Z3 will be when it will receive the lollipop. Waiting for lollipop update will worth it. I wanted to see how they update the stock apps to lollipop!!!!! Bloody showed us all the obvious things. I wanted to see how Sony implemented Lollipop. That guy shouldn't cover tech stuff in the future. He isn't very good. Damn that screen is blue. I can't imagine how much it would hurt your eyes in the dark. IMO any display hurts eyes in the dark. That's why I use Twilight even on my Z2. But yeah it's waaay too blue. you do realise that the camera that's used to take this video was set to the wrong white balance right? everything is blue, not just the phone's screen p.s Z3's screen is indeed blueish, but it never hurt anyone's eye and you can always fix it by recalibrating the screen's white balance level in the settings menu. When will SM-G900H (Galaxy S5) sold in Indonesia receive lollipop update ?